My brother bought a farm a year or so ago. He’s been adding fruit trees, chickens, fences, and all sorts of other improvements. He has five kids so I’ve been pushing for the addition of a tree house. They want to use the property as a retreat for people (they actually already are), so I’m hoping to convince him to save his money and then build the tree house as an actual living space. I had all of the kids draw up what they wanted in a tree house and I tried to incorporate as many of their ideas into my plan as I could. Below is my first pass at what this thing might look like. 1. For safety, maintenance, expandability, livability, and durability, the tree house was designed instead as a free-standing tree tower to be located among the trees rather than in it. 2. This design is based off a 4′ x 8′ sheet of plywood. The tower is made up of three 8′ squares. Walls are 8′ tall per floor. 3. The tower is located in a wooded area with tall mature oak trees and almost no ground foliage. The area is in a slight depression that can get a little muddy when it rains a lot. 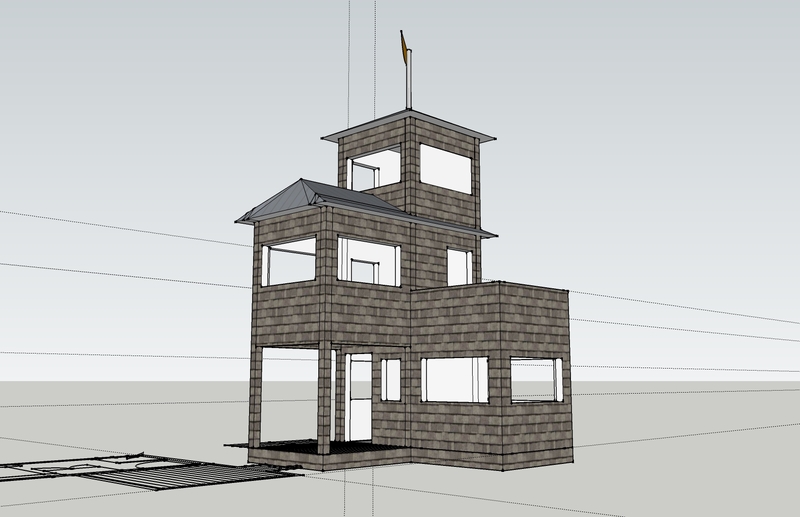 The bottom of the tower should be elevated above driveway height by about a foot. This will put it one to three feet off the ground. 4. Walls to be made of 2″x6″ lumber, insulated. Outside would be cedar shakes or Hardiboard painted about the color of the tree bark. Inside would be Sheetrock painted white. 5. Roofs to be standing seam metal construction. 6. Built-in furniture and floors would be semigloss polyurethaned oak. 7. Windows to be painted rust red or orange. 8. Lower deck could be made into a screened porch with permanent, removable, or retractable screens. 9. Second and third floors are accessed via split-rung ladder recessed into wall. 10. Second and third floors have trap door to cover ladder access hole to reduce the chance of people fall through that hole. 11. “Bedroom” areas can accommodate a queen-size bed and may be used for sleeping, or putting in a table for eating and board games. 12. Areas above windows in “bedrooms” contain storage shelves. These shelves could have LED lighting installed underneath to light the space. 13. Concrete footings need to be engineered to support this tall narrow structure and keep it stable under max wind loads for that region of the country. A soil survey may be necessary to ensure the design provides the necessary stability. 14. Upper deck has access to a tree stand/platform (more like a traditional tree house) via suspension bridge that is not attached directly to the tree tower (in case the tree falls over, we don’t want it pulling on the tree tower). The tree platform has a rope ladder for second means of access. 15. Install two-piece A/C system for comfort and to avoid musty, moldy camp bunkhouse situation. A/C system includes a wall mounted blower, a single wall penetration for coolant lines, and a ground-based compressor located outside. No ductwork needed. 16. The railing around the second story deck would probably be open wood (standard looking railing) or painted metal to give it a more open airy feel, but I was too lazy to model that for this concept. What do you think of this design? What should be changed? What have I forgotten? The second story roof is kinda beat up in this model. The front face should be one flat plane. do you watch the tree house show on hgtv? Didn’t even know it existed. I’ll have to check it out. Wow! I knew you would come up with something spectacular! Never thought about a tree house seated on the ground! Cool man! Looks like a $35,00 project!!! Mom Knee surgery was yesterday. Go to therapy today at Johnson and Hays. Anyone who gets to step inside will be MOST fortunate. Brian is so blessed to have such a brilliant brother!!! Yes, I realize that you are blessed to have Brian. This is a very neat project…hope it flies! Your mother past this on. What a neat place. Who would not want to spend the day/night there. What about a potty for overnight guests so the main house does not have to be used? Keep up the great ideas. I would love to expand it to be a true tiny house – add a bathroom with toilet and shower and a mini kitchen with fridge, sink, and microwave. At that point you are probably looking at making the upper floors much more accessible for people of more limited mobility with a staircase. kids get to enjoy their Uncle Jason’s creativity. Thanks for the kind words. “Evolve” is a key word. This is just a first pass to get ideas out for circulation. I’ve already been told we need to add a fireman’s pole, slide, and another crow’s nest. I love the dumbwaiter idea! Love the telescope idea too!